WILLEMSTAD - Prime Minister Eugene Ruggenaath has officially agreed to open the Curaçao Pride 2017. Last year, he opened the Pride in his position of the Minister of Economic Affairs. This time he opens the Pride as the Prime Minister of Curaçao. In his speech of 2016 became clear that he finds the acceptance of the LGBT community on the island very important. The organization of the Curaçao Pride is feeling greatly encouraged by the decision of the Prime Minister to open the Curaçao Pride again. “We are celebrating our fifth anniversary this year and we couldn’t have asked for a better start of this fantastic week. We will start the week with the Pride Walk. At 5.30pm we will gather at the Rif Fort and from there we walk to Wilhelminaplein. A brass band will join us during this festive Pride Walk. The Curaçao Pride will be held from September 28th through October 1st. 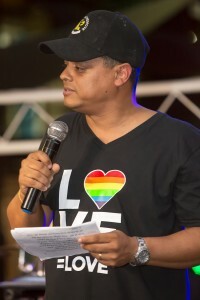 More information about the Curaçao pride and the agenda can be found on www.curacaopride.com and facebook.com/curacaopride.